Common and widespread in suburbs, parks, moist woodlands, swamps, gardens, hedges, forest edges, lawns, pastures, orchards. 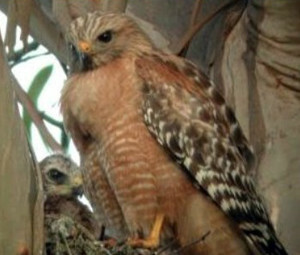 Often nests close to human structures. Listen for: whinny. Usually found near water. 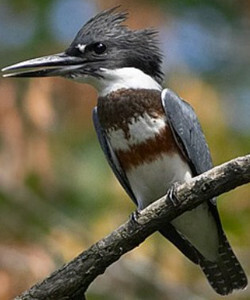 Feeds mainly on fish (often scavenged ) and waterfowl. 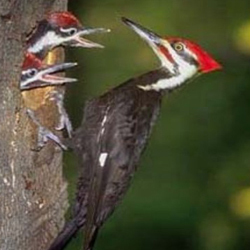 Mating system is monogamous. 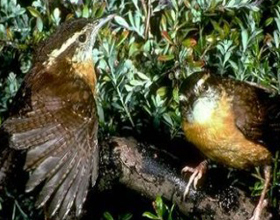 Nests on cliffs or in tall trees, usually near large bodies of water. 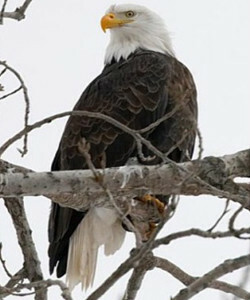 Offical bird of the United States. Listen for: high pitched whistling or piping. 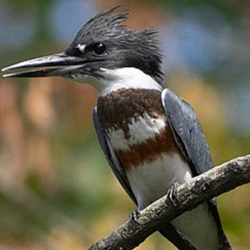 Numerous, noisy fisher found near wetlands, including freshwater ponds, streams and lakes. 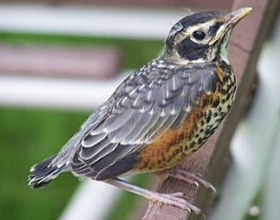 Listen for: shuttering, dry rattle (in-flight). 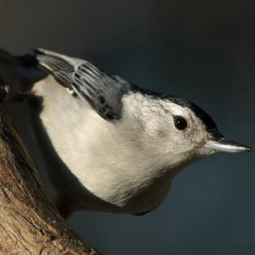 Common and widespread in oak, beech and pine forests, parks, villages, or suburbs. Very noisy and bold. Listen for: queedle-queedle-queedle. Found in large deciduous forests, mixed coniferous-hardwood forests around wilderness lakes, streams, swamps. 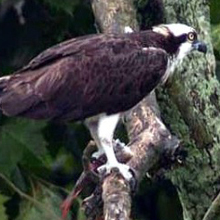 Often sits on low limbs waiting for prey such as frogs or toads. Nests near water in woods. Listen for: peet-seeeeep. or ki-dit, ki-dit (High-pitched, rapid). Sounds like childs squeaky toy. 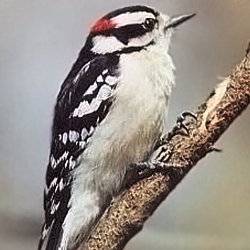 Widespread along woodland edges, hillsides and thickets, at times near human habitation. 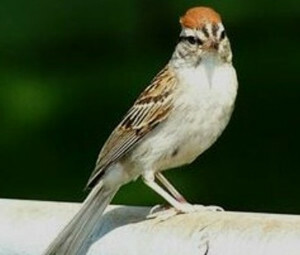 Though normally shy, often sings from an open perch. 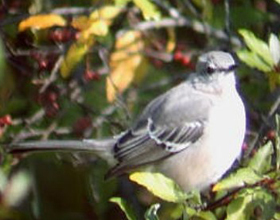 State bird of Georgia. Listen for: a mimic, with one or two repetitions of each song mimicked. 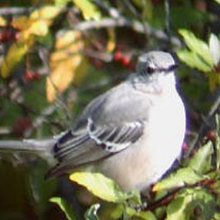 One of the most common birds in North America. Found in a wide variety of habitats near water. Flocks fly in V-shaped formation, often honking as they pass by. Listen for: honking. 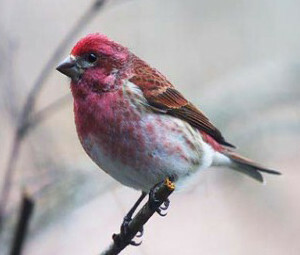 Common bird found in forests, woodland edges, swampy areas, clearings, fields, thickets, orchards, suburbs, valleys, foothills. 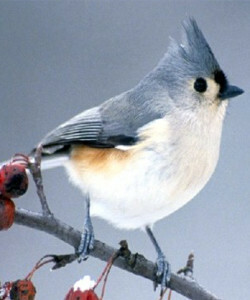 Often seen with Tufted Titmice and Downy Woodpeckers. Responds to pishing. Listen for: chck-a-dee-dee-dee. 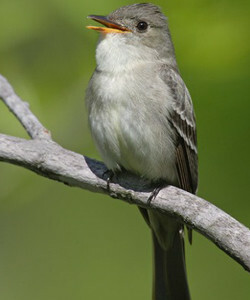 Common in brushy areas, moist woodlands and swamps, suburbs and gardens. Active and curious. Responds to pishing. Sings throughout the year. Listen for: tea-kettle, tea-kettle, tea-kettle. 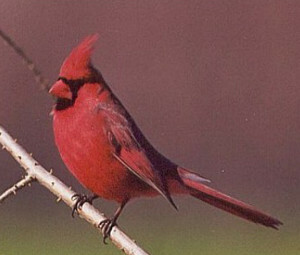 Abundant in woodland edges and forest clearings, and commonly found around suburban residences. Listen for: a rapid, dry, mechanical sounding trill. 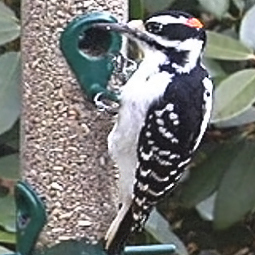 Small black-and-white woodpecker. 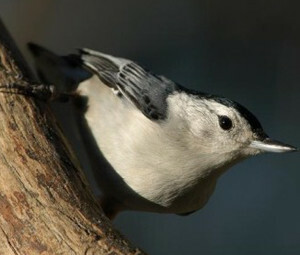 Common in mixed forests, suburban gardens and urban areas. May hand from small branches. Listen for: a descending whinny or flat pik. 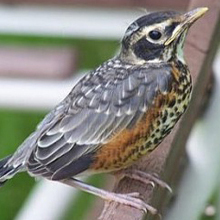 Seen in open woodlands, clearings, farmlands, parks, orchards, gardens, fields, along roadsides on utility wires and fences. 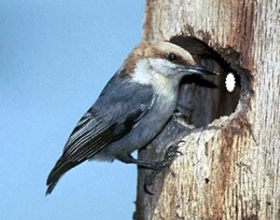 Numbers declining due to competition from starlings and house sparrows for nest sites. 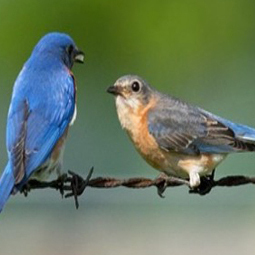 Making a comeback as people erect bluebird houses. Listen for: harsh, brief chatter. 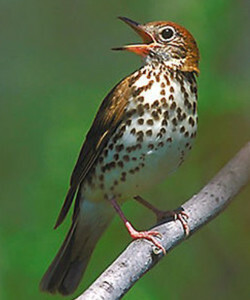 Habitat is woodland edges, old fields, thickets, undergrowth, brushy clearings, overgrown pastures. 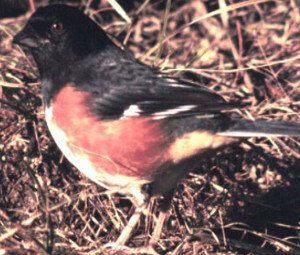 Known as Rufous-sided Towhee prior to 1995. Numerous but declining. Listen for: tow-weeee or drink-your-teeeeeee. 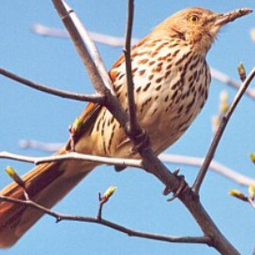 Numerous in deciduous and mixed woodlands and suburban areas. 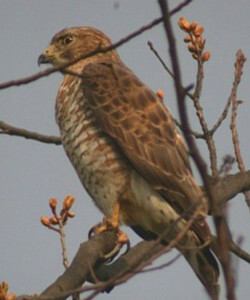 Prefers tops of tall deciduous trees, often sitting on a dead branch. Calls often heard from deep within woods during the day. Listen for: pee-a-weee or pee-yer. 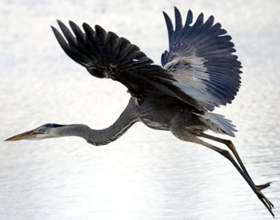 Great Blue Heron 46 in. 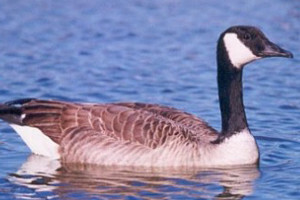 Common in river and lake edges and other wetland environments. May perch in trees. 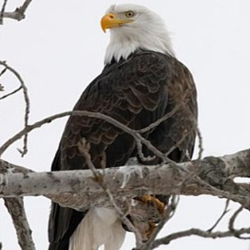 Usually stalks slowly or still-hunts alone. 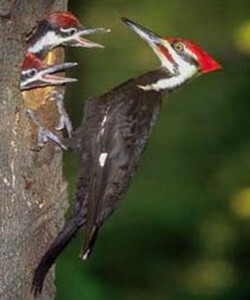 Listen for: very raucous squawking or croaking. 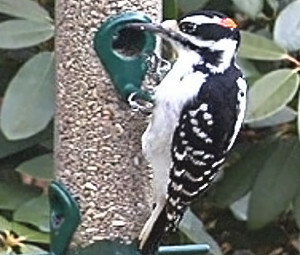 Medium-sized black and white woodpecker. 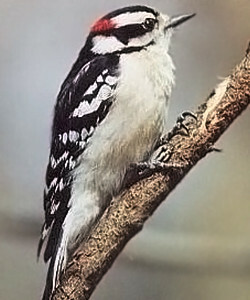 Shier than similar looking Downy Woodpecker. 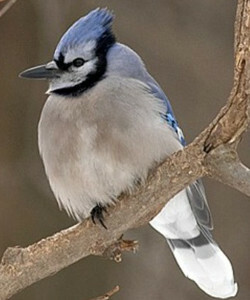 Resident of large wooded tracts; less often found around human habitation. 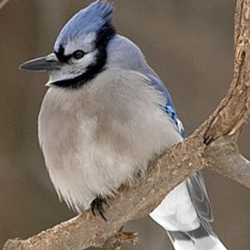 Listen for: whinny or a loud, sharp peek. Widespread and common in most habitats except deep forest. 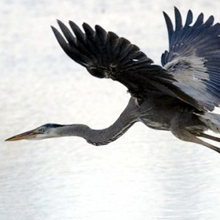 Wings make whistling noise in flight. 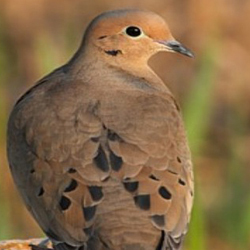 Sings just before dawn and throughout the day. Listen for: hooo-ah hoo-hoo-hoo. Very common. Seen in woodland edges, fields, thickets, brushy undergrowth, riparian areas. 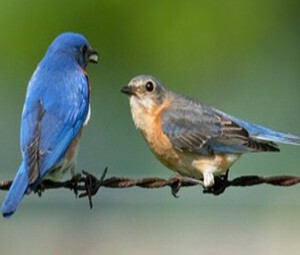 Both sexes sing almost the entire year. Listen for: purty-purty-purty. Common and widespread in open woodlands, suburban areas, gardens, pastures and towns. 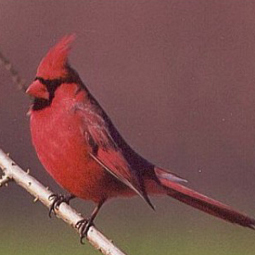 Male sings continuously for hours during the day or night throughout the year. 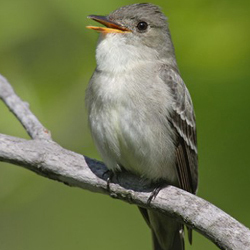 Listen for: an expert mimic of a wide variety of bird songs and other natural and man-made sounds, repeated three or more times. 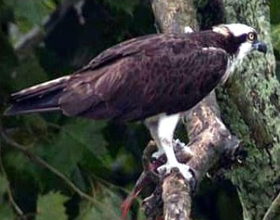 A large, black and white patterned hawk. 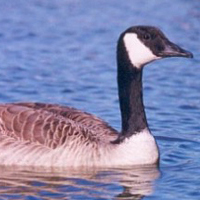 Common in coastal areas and on inland lakes. Resembles a gull in flight. 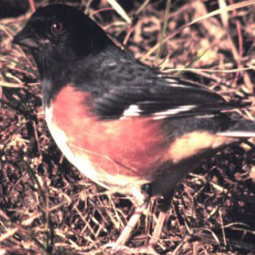 Perches on snags or rocks near water. Hovers over water and dives headfirst for fish. 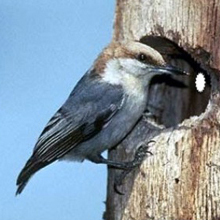 Large stick nests built in dead tress and man-made structures and platforms. Listen for: high-pitched whistle. Found in a variety of woodlands and some suburban areas. Shy but becoming tolerant of humans. Listen for: a loud kik-kik-kik-kik-kik-kik (rising then falling). 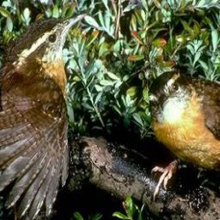 Found in open woodlands, conifer forests and suburban areas. 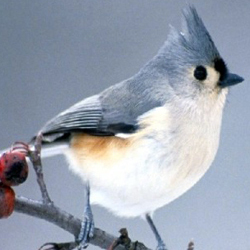 Often seen in small flocks at tops of trees. 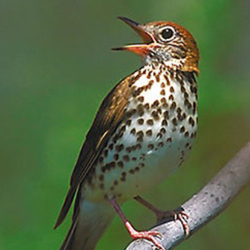 Listen for: fast, varied warbling. 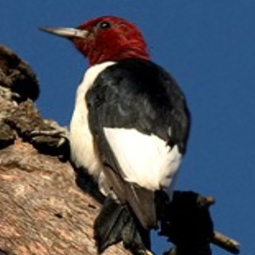 Common and conspicuous in open deciduous forests, wet woodlands and pine forests. 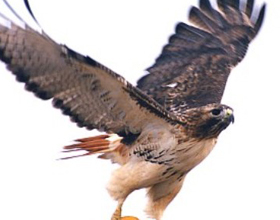 Undulating flight. Listen for: churr, churr. Found in woodland edges, farmlands, open groves of large trees, river bottomlands, suburban areas, parks. Often seen at large, dead trees. Forages on ground. Listen for: a high, raspy, squeer, squeer. 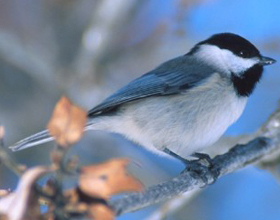 Resident of moist, mixed or deciduous woodlands, often near streams, swamps, wooded river bottoms. Prefers mature forests. 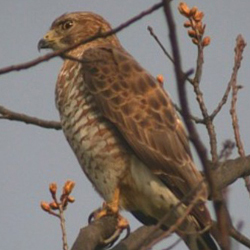 Hunts by perching quietly on tree limbs. Very noisy in spring. 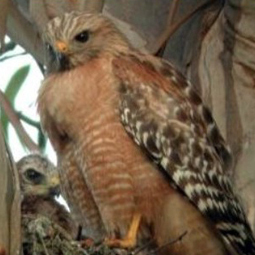 Red-shouldered hawks often return to same nesting area year after year. Listen for: kee-yer, kee-yer, kee-yer. 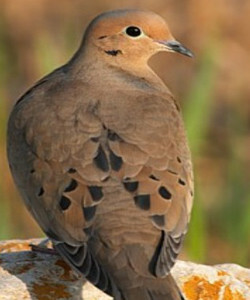 Common in a wide variety of habitats, including semi-open country with pastures or fields mixed with woods. 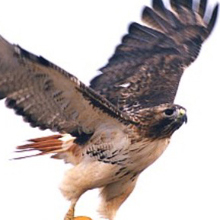 Commonly observed soaring or perched overlooking an open area.Preys on rodents. Listen for: keeeeeeeeer. 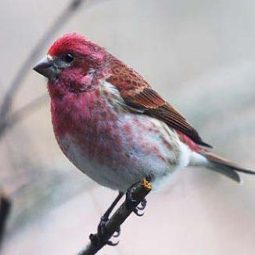 Common bird found in deciduous woodlands, suburbs, villages, parks. 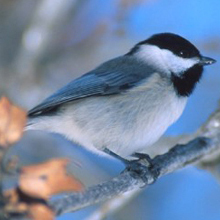 Usually seen in small mixed flocks with chickadees and other species following the breeding season. Listen for: peter-peter-peter or chiva-chiva-chiva. 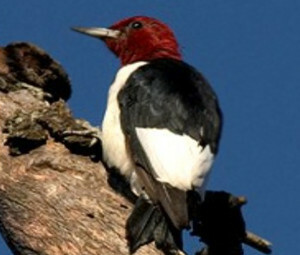 Common in large trees from forests to suburbs. 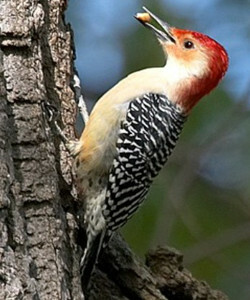 Usually seen moving down tree trunk headfirst. Listen for: a nasal ank-ank-ank or whi-whi-whi. 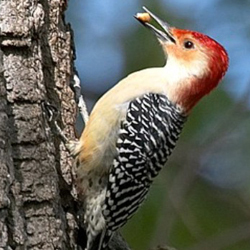 Numerous in moist deciduous woodlands, suburban wooded areas, swamps, wooded gardens, parks. 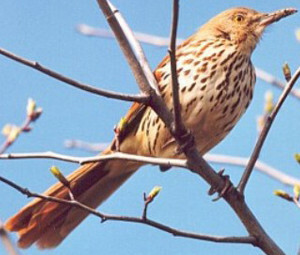 Often heard and seen near streams. 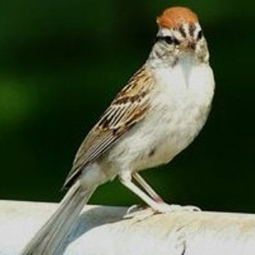 One of the most beautiful songs of any North American bird. Listen for: flutelike ee-o-lay-whrr.